Post whatever, whenever. About my life, my family, my likes and loves! Gracie loves helping in the kitchen, so it has motivated me to do more baking and cooking with her. 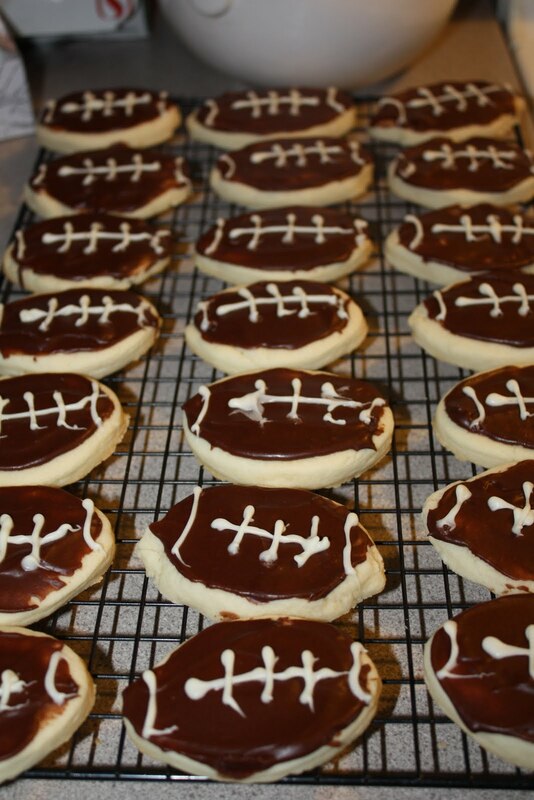 We were invited to a friend's house to watch the superbowl, so we made some cookies to go along. I couldn't make them catered to the teams playing as I didn't (and still don't!) know who they were! 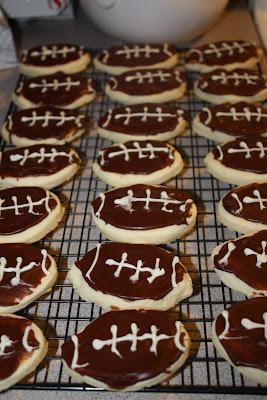 Saw these online several places, but just used a simple sugar cookie and chocolate icing for them. The "lacing" was melted white chocolate. EASY! So part of my absence the last while was due to being sick...morning (all day) sickness that is. Yup, baby #2 is well on his/ her way! It was a rough start due to being nauseous all day long. And it is much harder the second time around...chasing after a 1 year old sure makes is more of a challenge! 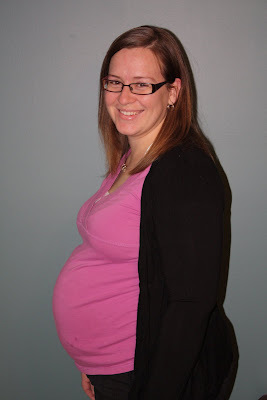 But at 24 weeks now, I am feeling much better. Baby is due to come mid June and we can't wait! Here's a belly pic, taken at about 20 weeks. Yes, my tummy is huge and no, I am not having twins. ;) Gracie loves kissing my tummy and rubbing the baby. Although I can imagine it is quite confusing - she loves her pretend baby right now and there is a baby in mommy's tummy. I seriously want in her mind to hear what she thinks! So far, she's excited! Okay. I've sucked at blogging. I've said it. I'm moving on. I'll update why in a future post. But beware...a bunch of posts will be coming your way. Tonight, I plan on getting a schwack done and scheduling them!! WHEW! 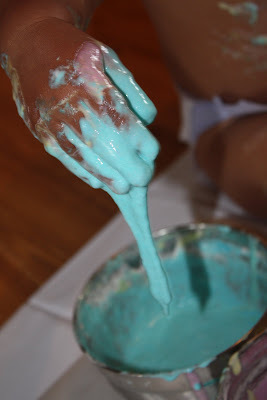 But, to go with the theme of today...I'll share what we did for Valentine's. 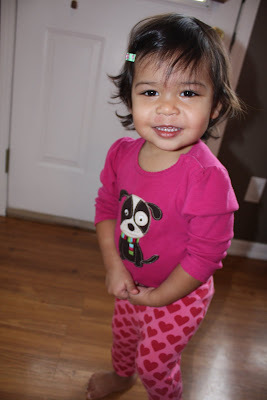 Here's my Valentine's girl! I don't really "believe" in this holiday, but since Gracie has come, I figure lets make a special day. Days are fun to plan when they have a theme, so we went with it. Since G is only 1, I didn't feel the need to put all her food into hearts! Phew - bypassed that for a year. We didn't make these today, but Gracie helped make them a few days ago to give to some of her friends we will see today and tomorrow. She did help with the tag! The best part about not being caught up with blogging?? Lots of options to post from! In the summer, my daughter G and I did some finger painting. Take a look! And you get a happy daughter, full of mess, laughs and smiles. Makes it all worth it! Only a couple of notes for next time. Not sure if cornstarch would work as well. Once her painting dried, it just crumbled, so we had to toss it. I planned on cutting it up and sending it to her grandparents. Also, I carried her up to the bath in a towel...and I still have small flour balls in the towel that I cannot get out. Oops! But overall so FUN! It reminds me that I've got to do this again this week! 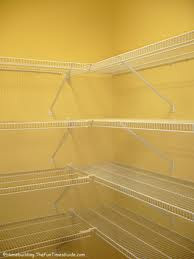 We have a huge pantry on our main floor (its like a closet, so not deep, but long shelves). They are those metal wire types. There is so much wasted space in it, so I'm on a mission to organize and gain more space so we can put everything behind closed doors and not on the counter! I thought the simple ways with cans was to get some of those stacking shelves like these. But nope! Not when your shelves are full of holes! Anyone have a better/ cheap solution? 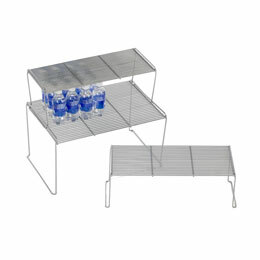 I thought of putting planks of wood, but I'm afraid they will be too heavy when you add the cans/ pantry items on top. Then I thought of piecing together cardboard...but that doesn't look too good! And your pantry has to look good, right?? Take a look at this one for inspiration. Mine won't be this nice! But organized. Is that too much to ask?? So it has been over 2 years since I last posted on this blog. TWO YEARS! Wow. Hasn't felt that long, but so much has happened! I didn't want my "relaunch" post to be the typical 'this is what I've been doing' and 'this is what I want to do with this blog', but really, that's what this post is! It can only go up from here! So in the last two years...we found out I was pregnant, moved back to Calgary, lived with my parents until our home in Medicine Hat sold, bought a house in Calgary, gave birth to our adorable daughter, moved into our house in Calgary (so if you are keeping track - yes, we lived with my parents when my daughter was born for a month! ), my husband changed his job, I've ha a couple of (very) part time jobs, celebrated my baby's 1st Birthday, and you know, just the day-to-day things! So now you are practically caught up. And the obligatory (is it, or is it just the easiest 'first post' ever?) "what is this blog about?". Anything. Whatever I feel like posting. Can be craft related. Parent related. Home decor related. Marriage related. Faith related. Photography related. Really anything. Whatever. Whenever. No pressure on myself for how frequent I post. So welcome or welcome back! My sister is handy in lots of ways (she does my business website - www.noteworthydesigns.ca, shameless plug), has lots of power tools, makes cards and can use a sewing machine! I wish I had that last one in my resume of creative things - but sadly, I don't. 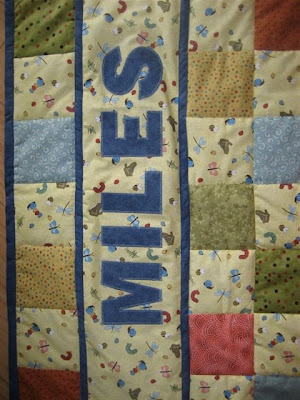 Here is a quilt that she made for one of her friends new babies - see if you can guess his name! 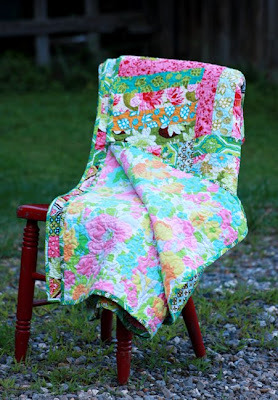 Can't wait to get my quilt...one day (another hint!). Sorry about the sideways photos - it is how they were sent to me. Go to Old Red Barn Co. and enter now! Or don't - and increase my chances of winning - just kidding!!! I love the colors in it too. ....into your stamp collection! The 2008 Retired Stamp List has been released today and there are tons of the list again that will be leaving the catalogue and never returning. FREE Shipping & Handling on any stamp set purchases through me (Laura Hit) that are on the 2008 Retired Stamp List. A great deal! I can't upload the PDF here, but will be emailing out a copy shortly. Please let me know if you would like to receive it! Here it is - our last challenge! 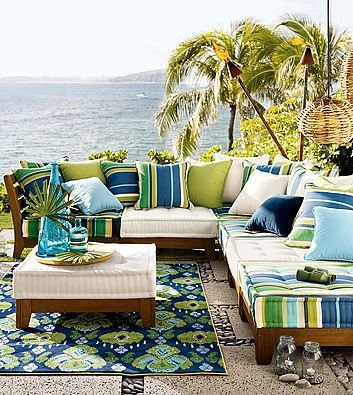 I found a photo on Pottery Barn's website and this was an inspiration challenge. The challengers were to take inspiration from the photo in any way - the colors, the feel, a certain element or anything else. Be sure to go to the bottom to see the winner! I planned all the challenges in week 1 and coincidentally, a few weeks afterwards, Kristina Werner posted a Color Inspiration challenge on her blog with a picture from the same patio set. Check out her link for more inspiration. Here is Michelle's last challenge. 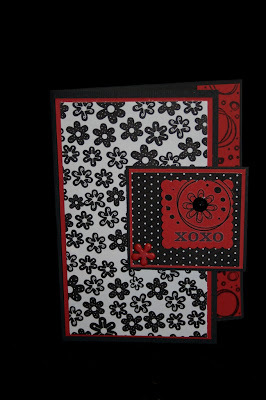 She is great at taking "non scrapbooking" stuff and turning it into a great card or project. The background are pieces from a sample book of lighting films (like photographers would use). Love it! And Joanne's final challenge card is this one. I love the colors and I love the square card. Nice work Joanne! This one is my card. ...Michelle! She wins the basket above, 20% off your order and the samples that I made during the challenge. And in 2nd Place (out of two, good odds!) is Joanne! Since you completed everything Joanne, I have a little gift for you too that I will mail. Nice work ladies, thanks for playing! Nice work ladies - 3 weeks done! It hasn't been hard, has it? And I think it has gone rather quickly! So Bootcamp Challenge Number 3 was a Limited Supplies Challenge. We were encouraged to use these items: A Wheel, Patterned Paper, A Brad or Eyelet and a Paper Punch. In addition, we tried not to use: Versamark Ink, White or Vanilla Cardstock and any Ribbon. Here are the photos from this week! Joanne's card is this one. Such dramatic colors and I like how she used different patterned paper. I'm always afraid, but this looks great! Nice choice! Here is Michelle's card. 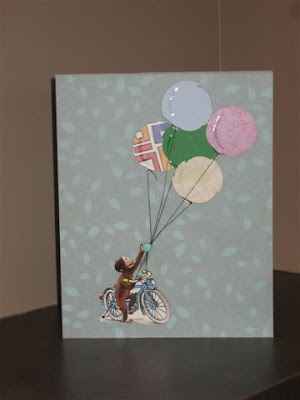 She didn't have a Stampin' Around Wheel, so interpreted that part how she wanted - the wheel on the bicycle instead! Love the creativity! 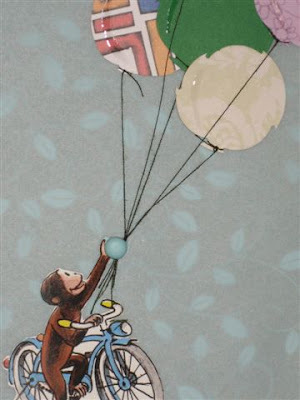 And for the paper punch, she used a circle punch for the balloons, but trimmed the edges to give them more dimension . Very cute! This one is mine. It was a huge challenge for me to not use vanilla or white cardstock! And I don't love just the two colors. But I think the little duck wheel is so cute! Laura W didn't have a chance to do one this week - if she does, I will post it. Stay tuned for the last challenge! I'm excited to see the outcome of this one! On the long weekend, I saw our trees start to bud into flowers. It was quite exciting. And the next day, our tree exploded with beautiful blooms. I am so glad I took a photo before we left for Ottawa because when we got home - all the pretty flowers were on the ground! Not sure what happened - a friend said that because spring was later this year, it could be that the season was just shorter. I am said, but glad to have photos to remember! It has been so fun watching our plants grow this year as we moved into this house late summer last year, so everything was going down hill (especially in our Medicine Hat heat!). This one is nearly all gone - just the nice burnt red leaves are left. I cannot wait for the peonies to bloom! They are my favorite and I have been waiting for them since we bought the house! This one feels so cool - kind of like rubber! Bleeding Hearts I think - I 'm so proud for knowing a few plant names! This is one is one of the ones with all the flowers that have fallen off. It was beautiful and now looks like it snowed under the tree with all the white petals. I thought this one was a lilac tree, but am suprised that the purple one is still going strong, but this white one is all gone. Maybe it is just the variety. Mesh and I so proudly planted this annuals in our front little patch. We were nervous that they wouldn't survive as we don't know what we are doing. We were sure to take some photos as proof in case they didn't, but so far, they look great. We are so proud! Edited to add: I took a photo today (June 1) to see how our flowers have grown and the progress they have made. I think it's cool to see them grow! 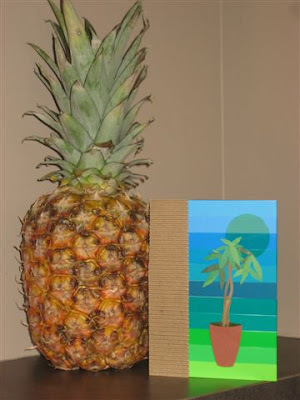 Nice work ladies - the cards are great! Hope you are enjoying it so far. 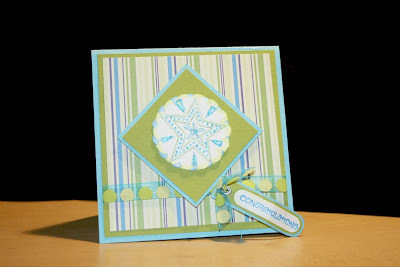 This challenge was based on a layout that I provided (inspired by Splitcoast Stampers). This one is Michelle's. I like that everyone's looks different and the themes are different. 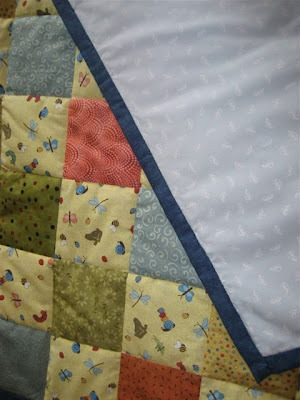 It is a nice use of different patterned paper - goes well together. I like the blocks as the central image - so cute! This one is Joanne's. 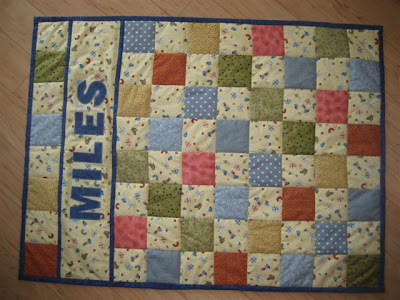 I like the bright colors and the use of the metal rimmed tag as the focal point! Plus those little buttons are so cute! This one is Laura W's. We made ours at the same time at our house - I love what she did with the scallop and put the two circle layers on dimension and glued the scallop straight to the card. So much, in fact, I ripped mine off when she left, changed the image and did a similar thing. This one is mine. Don't love it as it took awhile to get the size right! I decided to add the Old Olive layer underneath so I didn't have to start over. And at the bottom is using a Stampin' Up! rub-on sentiment. This past weekend, my husband and I went to Ottawa and Montreal for a few nights. One of my good childhood friends was getting married. My parents (also friends with the family) went as well, so it was a great time spending time with them. We had a blast and I thought I would share some photos. Mostly scenery though - I spent a lot of time clicking photos outside the car window and was pleasantly surprised how many turned out! Some wedding photos (I didn't really get any good ones to share). It was a big greek wedding (my first one) and it was really cool! The bride Michelle and I. She looked gorgeous! We went to Montreal as well. It was fun seeing the signs in French. I was in the car when I took this one and these people were laughing at a tourist (me) taking photos out of the car. So I tried to do it subtle, and barely made the picture! We visited a couple churches in Montreal - beautiful! Kindof a random photo of some chicken wings that Mesh had, but I really liked the photo!